Its coherent design makes the f1 cantilever chair a piece of furniture that ticks all the boxes, and yet it still manages to surprise time and time again. It is that all-rounder with a certain something. The chair has taken on a new guise this year and is now available with high-quality fabric covers or in an attractive combination of fabric and leather. The previous versions came in classic leather only, whereas the new versions with their subtle shades and broad range of colours open up new individual design possibilities. They can be used to spruce up a living space, ensuring that you see the room in an entirely different way. In the new design, the material itself becomes a key feature. The naturalness of the soft, textured fabric provides an exciting contrast to the cool, chrome-plated steel. The frame is like an endless loop, winding its way around the fabric and forming an elegant frame for the seat and backrest. 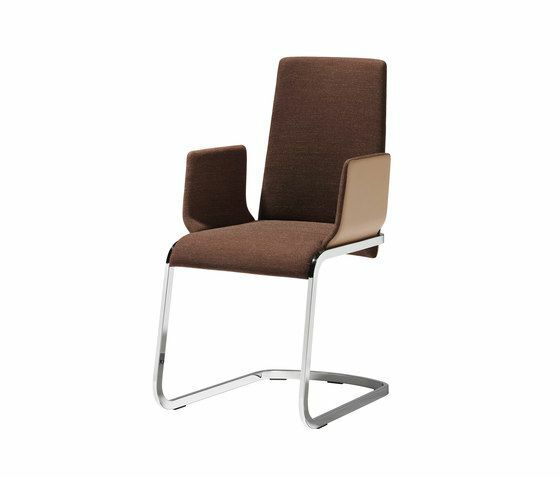 The cushions on the new-look f1 cantilever chair continue where the previous design left off, providing comfort over longer periods to whoever sits in them. The shoulder area adapts to the pressure from the body, while the lumbar support incorporated into the back section ensures that strain is taken off the lumbar vertebrae in the back. The wool in the design also helps you to sit comfortably. Wool, like leather, is a premium natural product with qualities that never fail to impress, being both hard-wearing and water and stain-resistant, and regulating both temperature and moisture. Its pleasantly soft touch also ensures exceptional comfort when seated.